One of the first science fiction novels to explicitly deal with genetic modification, H.G. Wells' The Island of Doctor Moreau, his third published novel, addresses issues surrounding humanity and evolution, genetic manipulation, and unresponsible science. 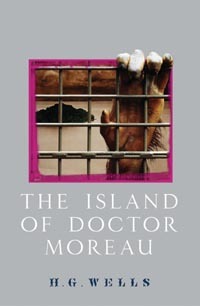 Taking place entirely on an island, it is foreign to the reader's relation to any geographical context, and like a nightmare, the reader is left wondering about the nature of the reality witnessed on Dr. Moreau's island. Edward Prendick, the sole survivor of a shipwreck in the Pacific, is rescued by a schooner whose captain abandons him on a small island. Prendick horrifyingly discovers that Dr. Moreau and his assistant, Montgomery, are performing a type of animal vivisection. He soon learns that they are attempting to create men from beasts. The experiment fails, and the creator is called by his creations. Prendick eventually finds rescue and returns to his home in England, his mind forever impressed by the events on the island of Dr Moreau. H.G. Wells' fascination with Darwinian theory manifests itself most cleary in Moreau. Indeed, Wells cleverly relates the concept of genetic manipulation to the overall scheme of evolution, in that Dr. Moreau's experiments are an attempt to link beasts to "superior" humanity. Moreau's novel demonstrates that eugenics goes far beyond mere "human improvement," but enters into the whole idea of what constitutes humanity considering evolutionary ethics, eugenics, and race. Indeed, as Robby Kossman wrote in 1880, "The Darwinian world view must look upon the present sentimental conception of the value of the life of a human individual as an overestimate completely hindering the progress of humanity" (Weikart, 2). Eugenics incorporates and capitalizes on the ideas of evolution, which in turn alters basic notions about the human race. Moreover, Wells demonstrates the dangers of the "hardened scientist," who jettisons any notion of a bioethical standard. As Moreau says, "To this day I have never trouble about the ethics of the matter. The study of Nature makes a man at last as remorseless as Nature" (163). The concept of science and evolution at the cost of pain is a continual theme throughout the novel. Indeed, much of the scientific and medical community's major reason for not pursuing even more with genetics is due to the safety of the patient. If this were to be overcome, scientists may continue without concern for bioethical standards. Consider Wells' own view, who was quoted as saying, "There is only one sane and logical thing to be done with a really inferior race, and that is to exterminate it" (Weikart, 185). The closing thoughts of the protagonist most strongly reflect the evolutionary views of the author. "There is...a sense of infinite peace and protection in the glittering hosts of heaven. There it must be, I think, in the vast and eternal laws of matter, and not in the daily cares and sins and troubles of men, that whatever is more than animal within us must find its solace and its hope" (221). Studying chemistry and astronomy, he is able to find the illusion of solace and hope. He is now aware of the secrets of human origin, of its animal nature, and of the "natural trend" of creation. Yet he is also haunted by a dreadful sense of emptiness which embodies the ultimate conclusions of an evolutionary worldview. The science of genetics has fundamentally reconstructed his ideas about the nature of the human being, and he sails off in infinite solitude.